Born in the Great Depression and forged by the challenges of World War II, the Easton Lions Club entered the Post-War era with seventy-two members in a town of just over 6,000. Over the next sixty years while the membership ebbed and flowed, the needs of the community would only grow. In 1951 you could still get a fried chicken dinner for under a dollar at Topsy’s Chicken Coop, one of the many restaurants where the Lions have met over the years. In that year the Lions hosted an Annual Child Welfare Night benefit. The club called in the assistance of the Brockton DeMolay and Rainbows to produce a musical featuring familiar tunes like "Singing in the Rain" and now unfamiliar ones like "My Sugar Is So Refined." By 1959 the Child Welfare Night event was clearly being challenged by stiff competition from TV. That year’s event featured Tom Keith and his 3,000 slides and mile and a half of film on his 48,000 mile journey through the South Seas. Celebrating its 30th anniversary in 1961, the officers reminded members that over the years Easton Lions had raised money through dances, card parties, door-to-door light bulb and tea sales, and shows of all descriptions including carnivals. For the anniversary Child Welfare Night was reinvigorated with a concert by a local symphony orchestra playing classical and pops selections. But two years later while club members served 150 guests a roast beef dinner cooked by the man who ran the lunch counter at Fernandes Supermarket, the best entertainment the club could muster was a demonstration of the different cuts of meat available at the market. That roast beef dinner did fund a supervised summer playground program run in association with the Frothingham Park Trustees. This Lions program was very popular and ran for about two decades. Funding was also provided for the new Lions skating rink near the Center School. After the unexpected death of Arthur Yardley, King Lion in 1957-58, the rink was named in his honor. The club also donated $250 to the Citizen’s Scholarship Fund, the equivalent of about $2,000 in today’s money. By 1965, the annual Child Welfare Night had run its course, and the club entered a new era by sponsoring its first annual Recognition Night at the 400 Restaurant. That first event awarded only an Outstanding Service Award to John Linehan. Three more awards followed in 1969 when Connie Spillane, Reverend William Fox, and Alfred Gomes won for Public Servant, Humanitarian, and Heroism respectively. The following year Kathryn Healey won the first Outstanding Educator award, and Mike Macuch became the first Youth award winner. The final major award was added in 1976 when Margaret Carrigan won the first Senior Citizen award. The club’s original tradition of handing out Thanksgiving and Christmas baskets to needy families continued into the 1960s, and, as always, the club supported a variety of youth programs. From the beginning the Easton Lions have also focused on public health and safety. During the 1960’s, a Knight’s of the Blind, the club donated to eye research, updated eye-testing equipment in the schools and ran clinics for diabetes and glaucoma. The Fire Department received a rescue boat for use on Easton’s many ponds, and later a resuscitator. In the days before EMTs and town ambulances, the police department often provided the first medical assistance at an accident so the club equipped the department with portable stretchers. Unfortunately, despite all this good work the club was slow to catch the wave of change that swept through the country in the 1960’s. While the woman’s movement pushed forward nationwide a Lady’s Night was still a feature of our annual calendar, the one event to which member’s brought their wives. In 1965 it was held at the then famous Blinstrub’s Restaurant in South Boston with the entertainment provided by Abbe Lane and Xavier Cugat. 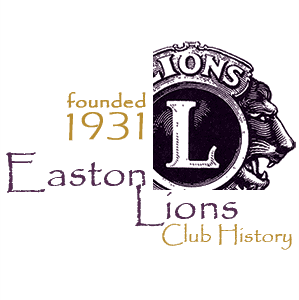 Unlike other Lions Clubs, Easton never launched a Lioness Club and waited until the new millennium to induct its first female member. The club also did little to appeal to young adults losing membership to the Jaycees who at least had an associated Jaycette group. Membership sank below 50, but the needs of the town continued to grow. During this low point, the club still sponsored a Cub Scout pack and a Little League team, donated to the Mass Lions Eye Research Fund and the Citizen’s Scholarship Fund, and continued traditions such as the Thanksgiving and Christmas basket donations. The supervised playground program remained a major focus of the club while the highly successful Yardley rink kept the Lions name in front of the public. The club’s 45th anniversary coincided with the nation’s bicentennial in 1976. No charter member remained with the club. However, Al Brooks, who joined in January, 1932 was celebrating his 44th year as a Lion while actively participating in the town’s Dual Celebration Committee. Next longest in club service was Harold "Ike" Boone who had been a Lion for 22 years (he would reach 45 years in 2000). The report issued for the 45th anniversary announced that the club had added several new funding raising projects to supplement the annual light bulb sale. Number one was a golf tournament, but the most progressive was a paper-recycling program. Beginning in 1973 the club maintained a paper collection trailers at the landfill and some major intersections. By 1976 a million pounds of paper had been recycled despite having two trailers destroyed by fire. Recycling paper became a joint venture with three Girl Scout troops, four Boy Scout troops, the town swim team, the Covenant Congregational Church youth group, the OA Band and Honor Society, and the Citizens Scholarship Foundation. Before passing this project on to others, two million pounds of paper had been recycled. Concern for the environment continued into the 1980s when the club initiated plastic bottle and aluminum can recycling. While these programs were also successful fundraisers, Lions can take pride that ultimately the town developed its own recycling program that continues to this day. By the end of the 1970s many men were aging out of the Jaycees and turned to the Lions Club to continue their commitment to community service. These included familiar and long time Lions such as Bob Kane, Charlie Hammond, Bob Govey, Louis Piantone, and Lee Williams. Under the leadership of King Lions like Louis Piantoni, Leo Kobs, and Joe Carvalho, the club began to grow again reaching 91members by 1989. Many programs familiar to Lions today began in the 1980s. In 1986 the club hosted its first annual televised charity auction. The North Easton Village Merchants Association hosted the first Tree Lighting Ceremony on December 6, 1987. The club had a food booth at that first event tucked away on the grounds of the old High School, but just two years later the Lions took over the whole event and have run it ever since. Besides the bottle and can recycling mentioned earlier, the decade of the ‘80s featured one of the most unusual Lions’ event. George Brodie came up with the idea of running an annual dog show at the old Villa Rosa picnic grounds. This was a legitimate competition that attracted entrants from outside the town and was the ancestor of today’s Reindog Parade. Membership continued to grow in the 1990s thanks to “chief recruiter” Lee Williams. Several new fundraisers were held including the sale of commemorative cup plates engraved with famous Easton buildings and a monopoly-like "Game of Easton." Under the leadership of Paul Tanner, Jr. the now familiar Peace Poster contest was launched. In 1999 a joint effort by the Lions and local businesses led to the purchase of the first "Jaws of Life" for the Fire Department. In the first decade of the new millennium, membership in the club was opened to all Easton residents, and the club flourished. From 2002 to 2012 the club raised $220,000 for eye research, $200, 000 to support local community and youth groups, and an additional $60,000 for Easton scholarships. Organizations assisted included FEEE, HUGS2, the Boy and Girl Scouts, the VFW and American Legion, Homes for Vets, the Garden Club, the Food Pantry, the Natural Resources Trust, Easton Youth Baseball and Soccer, and many High School teams and groups. Of course, this decade also saw our club, under the leadership of Nancy Sullivan, declared the best Lions Club in the world in 2008. Henry Narsasian’s Junk Day continues the club’s tradition of recycling while adding an excellent source of funds. Lee Williams’ visit to a Lions Club operation in Florida led to the opening of our own Thrift Store that is now a major revenue source. Junk Day, the TV Auction, the Golf Tournament, and the Thrift Store make the Lions Club the most successful fundraising organization in Easton and allow us to continue to assist so many community projects. Today, the Eyemobile provides free eye, ear, and health screenings, and the club provides free eye exams, glasses, and hearing aids to needy people, young and old. We have sent bicycles to Cambodia, emergency aid to New Orleans and Haiti and in general lived up to the slogan "where there’s a need there’s a Lion." In addition to our serious commitments, the club provides a lot of the “glue” that sticks our community together with events big and small including the Senior Citizens Cookout, the Cape Cod Walkalong, the Peace Poster contest, the Children’s Halloween Parade, Christmas visits to nursing homes, Recognition Night, the new Talent Show and many more. Add to all this the service of individual club members in the life of the community, and you can see that Easton wouldn’t be the same without us! But beyond fundraisers, donations, and events, the Easton Lions Club is fun. Whether it’s the regular bimonthly meeting, the behind the scenes camaraderie of the crews working at the Holiday Festival, Junk Day, or the Thrift Store or our many public events Easton Lions have fun while doing good.